Wooden Play Kitchen Sets are Fun and Educational! One of my favorite things to do as a child was to visit a neighbor girl's house to play with her wooden play kitchen set. She had a white kitchen very similar to this one, and had a full set of Corning Ware cookware for children. My parents always knew where to find me when it was time to go somewhere! My little girl had one when she was about three. She had all the toy cookware, too, including a toy mixer, blender, and coffee pot. She loved it and spent many hours playing in her room with her kitchen. When my sister's children were small, her husband built a plywood kitchen with a stove, refrigerator, and sink combination set for my niece and nephews to play with. My sister painted it in bright, cheery colors. These days, after a paint touch up, it looks like new, and her grandson plays with it. Well-built toy kitchens can last several generations, if they are cared for. Kids enjoy the chance to mimic their moms and dads safely, learning to pretend play 'cook' and clean up afterwards. The tea parties where your child presents cookies or cupcakes 'baked' just for you will create warm memories for both of you. I treasure the memories I have of playing with my daughter, pretending to eat the pretend food she cooked for us. More recently, I have enjoyed playing with my granddaughters, eating the delicious pretend cakes and cookies they prepared. Kids love playing like they are cooking--just like mom and grandma. These kitchens set the stage for their amazing imaginations. The vintage style kitchen below comes in several colors. 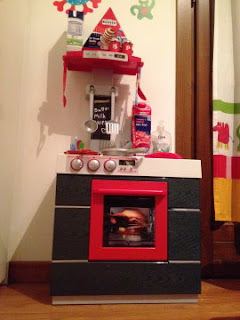 There are other styles of kids toy kitchens, too, including an orange kitchen and a more modern chrome looking kitchen. This retro vintage play kitchen features a microwave oven, countertop stove burners, oven, refridgerator, freezer, and lots of storage! The sink is easily removed for cleaning. With the phone, kids can chat while cooking! You can get it in blue, pink, red, or the more traditional white. What About Old Kitchen Play Sets? Sometimes you can come across great deals on old, but still functional, kid's kitchens at yard sales or garage sales. A little TLC and some paint may be all it needs to look brand new. If you go this route, make sure you purchase the right kind of spray paint. For instance, if it is a plastic play set, it will need paint designed specifically for plastic toys. Not just any spray paint will adhere to plastic play sets and stay looking good. A paint like the Krylon Fusion brand is best. A new coat of paint on an old kid's kitchen is a great money saver! Prefer a More Modern Play Kitchen? The Guidecraft All in One Modern Kitchen is sleek, featuring a rich espresso finish with silver accents. With a fridge with shelf and write-on, wipe-off marker boarda, sink, microwave, oven with pull-out rack, dishwasher, open and close storage, and a wall phone, this cute kitchen will give hours of play fun. Assembly required. Want to build a diy play kitchen like my sister and her husband did rather than purchase one? This may be the best solution to providing your child with a toy kitchen, since it can be built for the exact spot where it will be placed. It can also be painted or finished to match the child's bedroom, or if it is in a corner of the kitchen or dining room, the decor could match those rooms. Play kitchens allow little girls and boys to imagine themselves in the role of cooking and caring for the family. Do you think they are important, too?